High quality twill letters and numbers look great on any of our jerseys! Available in all school colors and a variety of fonts. Pricing starts for basic 1 color 8" twill #'s (1 or 2 digits) on the back of the jerseys for $4 per jersey. Your price increases with each option you add. 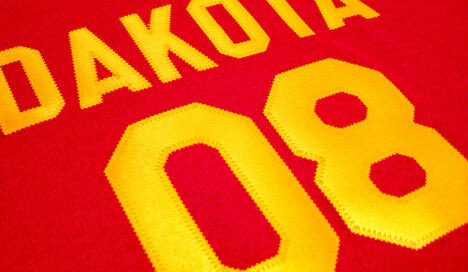 These permanently heat applied twill numbers and letters are made specifically for athletic jerseys with a sewn-on look.